This is the second time making an amazing Panzanella salad that I’ve groaned in disappointment when downloading the photos. I struggle with photographing ‘busy’ dishes; ones where a wide array of ingredients take center stage. I look down at it, my breath catching because it’s so lush and lovely, then after the fact, when the memory card is emptied, I curse it under my breath. There just doesn’t seem to be a way to capture the ‘Too Much’ principle of what’s happening in the bowl. This one came as close as I could…..
….but even this doesn’t tell you how beautiful this salad turned out. It’s September, a glorious intro to the month has occurred with incredible weather; warm sunny days and cool nights that hint lightly of the coming Fall. The markets are staggering under the weight of the season’s bounty, and it just boggles my mind what farmers are bringing with them each week. I am so easily overwhelmed by the loaded tables as I wander up and down the rows at my favorite location, checking out quality and price, eyeing the vendors, wondering how much they’ll haggle with me. Three baskets of zucchini for the price of two? How much is left in your truck? If I buy 4 sweet gypsy peppers, can I get a few small, tiny ones thrown in for good measure? After many visits, and lots of questions, you know who’s willing to negotiate with you. You know their faces, worn and tired and overwhelmed themselves; you know who just wants to move the bounty and who isn’t willing to budge. And it never hurts to ask. The worst they do is shake their heads and tell you ‘No’ and then you move to the next table, to the farmer watching you closely, who possibly heard your request and is more than willing to compromise. In fact, she’s already reaching for what you want, naming her price. In the last 15 minutes of the market time, you just never know what you can get away with, and it’s always fun to ask. I’m always on the lookout for something different each week I wander those open air aisles. I gravitate towards that which looks odd or different. While others may grasp basket after basket of beefsteak tomato, I’m the one reaching for the Carolina Gold- a bright orange variety that’s less acidic than it’s red brethren. I look for cherry tomatoes in a rainbow of colors- orange, yellow, white, black- and am drawn to those tables. I don’t want convention. I don’t want the norm. I want something that will dance on my tongue and stretch my imagination, colors that cross the entire spectrum, foods that wake me up. I’ll bypass the standard cuke in favor of an heirloom Lemon Cucumber, round and crisp as an apple. Sweet Yam Leaves? They taste like mild spinach, says the farmer, and she laughs as she warns me ‘Be careful if you buy them; they’re going to become your favorite green!’ and she’s right. I go back, time and again to her table, buying two enormous bunches at a time until she’s past the prime of these sweet, tender and delicious greens, shrugging her shoulders at my request. ‘Next year’ she assures me, and my mouth grimaces. That seems so far away already. The variety in this Panzanella salad isn’t much out of the ordinary, unless you look below the surface. It’s still tomato, and dried bread, but in this case, it’s a loaf of sesame semolina bread that I made without adding the salt, rendering it just out of the palate’s acceptance. The remainder of it was doused with a heady olive oil, redolent of fresh herbs and crushed garlic, then slowly baked in a moderate oven until the cubes were solidly dried out. A basket of the aforementioned colorful cherry tomato went in to the bowl, to soak in to the bread alongside grilled zucchini and eggplant. A shower of fresh green herbs and an hour on the counter top and whether or not it was a beauty that I captured with my camera or not, when it entered my mouth it was perfect. Perfect because it’s September and it tasted like sunshine. Perfect because I did little to it besides grill a few vegetables and make sure the seasoning was right. It doesn’t need much, if anything, and when pointing the camera at it, a bowl full of the bounty of a season, it was almost too much to capture, like the very season itself. I couldn’t take just one photo to explain September, as much as one taste of this dish could never justify it’s contents. The season is like one long explosion of sight, smell and flavor that refuses to be held down, caught on film or chronicled on paper. It can only be experienced, like an open air market, like a fresh tomato off the vine, still warm from the sun and bursting through its skin. It bucks explanation, and convention. But it never disappoints. Does one really need a recipe for Panzanella? Good croutons, whether from scratch or store bought is the key, along with perfectly ripe, juicy tomato. Beyond that, it’s up to your imagination. Use good sea salt and fresh cracked pepper, add a few splashes of a good olive oil and use a gentle turn of a rubber spatula so you don’t break everything up too much. 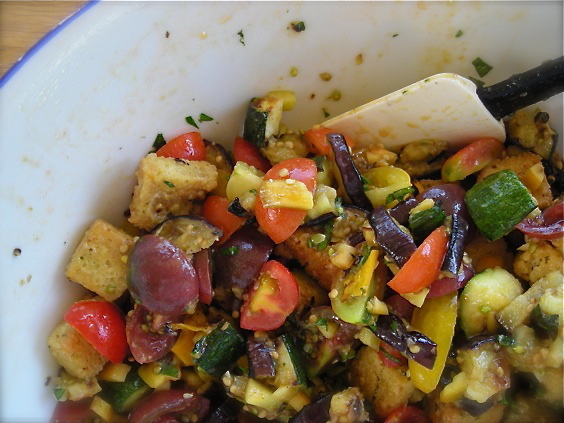 Serve it over greens, if you wish, or add more chopped vegetables to make it heartier, like my version, and that of my friend Laurie, who has an amazing and colorful Panzanella on her site as well. Indulge in the bounty of September, and there will be no disappointment. For more inspiration and recipes utilizing Summer produce, check out my friend Jen’s blog too. Her post on Easy ‘Summer’ Meals has a lot of options. Hello lovely you. I’m so glad we saw each other. I really wish we could have spent more time together. Some day soon? I want to take a trip up north just for you. Ok? Now I would like panzanella for breakfast thank you very much. My mouth is watering. Might have to do scratch the itch this weekend.